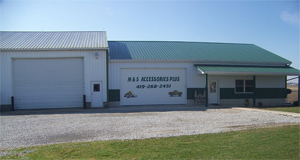 M & S Accessories Plus, LLC is a small family owned business ran by Mike and Sandy Chrisman. We have been accessorizing and repairing vehicles, selling parts, winter apparel, and power sport accessories for over 20 years. At a young age, Mike started working at his parents body shop when he was 18 years old. Many years later when his Dad decided to get out of the business, Mike made the decision that it was time to start his own automotive repair business, just like his Dad. So in 2002, Mike and Sandy established their own business at their own home. Since opening, M & S Accessories has expanded by creating a show room, adding on an automotive body repair shop, and a high-quality down draft paint booth where we use environmental free water-based paint. We specialize in customizing your truck and automobile with accessories such as bug shields, vent visors, running boards, bed liners, mud flaps, decal lettering, chrome accessories and much more! At M & S Accessories, we have over 50 years of experience combined with our employees where we promise to give you affordable, high-quality automotive body repair and paint, top notch accessories, and great customer service. We are always ready and willing to handle all makes and models that come our way. Once a customer, Always a friend!